ALL-NEW MIRACLEMAN ANNUAL #1 Unites Morrison, Quesada, Milligan & Allred. Presenting Your New Look at This Star-Studded Issue! New Year’s Eve is about to get even more miraculous as four of the biggest names in comic book history bring you new Miracleman stories for a new generation. Today, Marvel is pleased to present your new look at ALL-NEW MIRACLEMAN ANNUAL #1, uniting celebrated comic creators Grant Morrison, Joe Quesada, Peter Milligan and Mike Allred for one, star-studded issue that should not be missed! First, a story over 20 years in the making – Grant Morrison’s long-lost Miracleman tale will finally see print for the first time! Famously unpublished, this much talked about Morrison script will finally be brought to life by legendary artist & Marvel Chief Creative Officer Joe Quesada! A much talked about piece of Miracleman history, experience the foreboding tale of the one Kid Miracleman on the eve of the Battle of London! Then, comic superstars and fan-favorite X-Statix creators Peter Milligan and Mike Allred take you back to the glory days for an all-new Miracleman classic! Miracleman, Kid Miracleman and Young Miracleman do battle against the awesome and terrifying might of Dr. Gargunza! Yet something is not right. A sense of unease. Something in Miracleman’s own mind! What is Project Zarathustra? 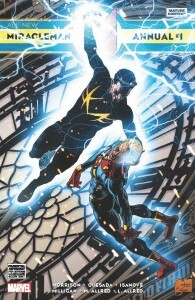 If that wasn’t enough to make ALL-NEW MIRACLEMAN ANNUAL #1 the can’t miss comic of the year, this issue also comes jam-packed with extras including Grant Morrison’s original script, sketches, original art and more! Launching alongside S.H.I.E.L.D. #1 as one of only two Marvel comics on-sale New Year’s Eve, these two must read issues will help you close out 2014 with a bang! Be there when Morrison, Quesada, Millgan and Allred unite for the most star-studded comic you’ll read all year! Don’t miss ALL-NEW MIRACLEMAN ANNUAL #1 – hitting comic shops and digital devices on 12/31! 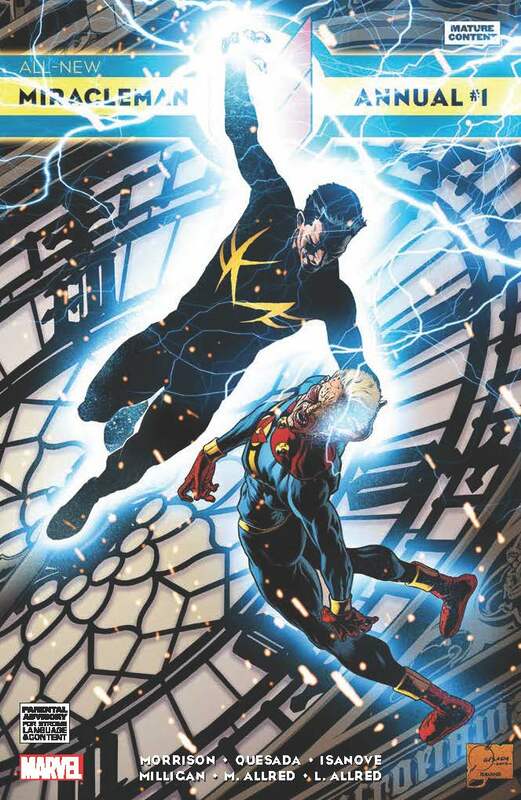 Debuting on New Year’s Eve, ALL-NEW MIRACLEMAN ANNUAL #1 stands as one of only two Marvel Comics hitting shelves on the final day of the calendar year. Launching alongside S.H.I.E.L.D. #1, Marvel Comics is ready to close out 2014 with a colossal bang! Be there when Grant Morrison, Joe Quesada, Peter Milligan and Mike Allred take the Miracleman mythos to new heights for the blockbuster ALL-NEW MIRACLEMAN ANNUAL #1 – hitting comic shops and digital devices on 12/31!